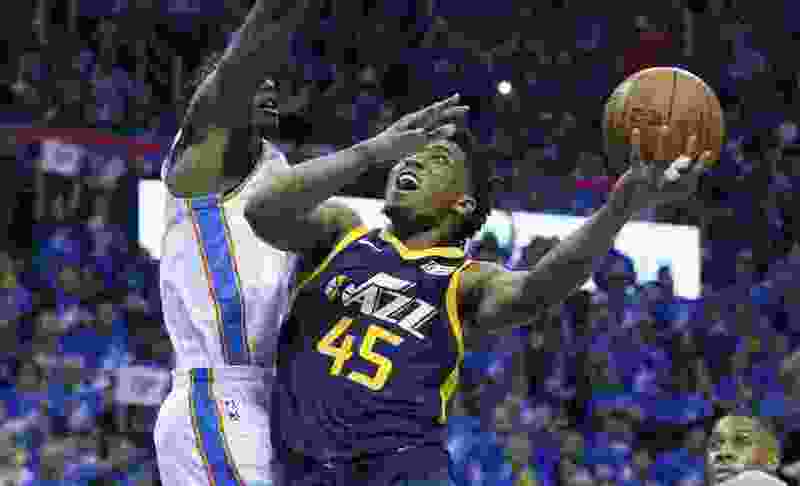 Oklahoma City • On Monday afternoon, in the moments after the Utah Jazz ended practice, the official word was put out on Jazz rookie Donovan Mitchell: An MRI confirmed a left foot contusion. The team will know more concerning his Game 2 status on Tuesday. That’s the official word. But, nobody really believes Mitchell isn’t going to play. Jazz forward Royce O’Neale said he believes Mitchell will be fine. On Monday, Mitchell seemed to be in good spirits. Most importantly, the Jazz made their star rookie available for media interviews. They typically don’t do that for injured players. The question about Mitchell isn’t so much whether he will play, but how close to 100 percent he will be. Mitchell was in obvious and real pain on Sunday when he stubbed his toe against OKC shooting guard Alex Abrines and had to leave the game for X-rays. Mitchell returned in the fourth quarter and played through the pain, but Jazz coach Quin Snyder pulled him for good late in the fourth when the game got away from Utah. If Mitchell is at or close to 100 percent, he poses an issue to the Thunder. In Game 1, the Jazz guard scored a team-high 27 points on 11-of-22 shooting from the field. He grabbed 10 rebounds, becoming the first rookie to have a debut as gaudy since LeBron James in 2006. It’s understandable why the Jazz would have some concern. Mitchell and Dante Exum were the only two Utah players who were able to beat OKC defenders off the dribble on Sunday. Exum did most of his damage with a solid fourth quarter as the Jazz tried to rally. Mitchell scored nine points in the first quarter and continued his barrage through the corresponding three quarters. The Thunder have dealt with various injuries in the last week, including a few they suffered on Sunday night: Paul George left early with hip soreness, while Steven Adams appeared to have some hand pain late in the game. Both participated in Oklahoma City’s Monday practice, along with Corey Brewer (knee) who played through some pain in Game 1. None of the injuries are expected to keep anyone out for Game 2 on Wednesday, but the Thunder didn’t push it, either, in a non-contact session. Jazz forward Georges Niang was named to the All-NBA’s G League first team on Monday afternoon. Niang is with the Jazz on a two-way contract and has been playing for the Salt Lake City Stars since January. With the Santa Cruz Warriors, he averaged 19.7 points and 6.7 rebounds per game. He also handed out 4.3 assists per game. With the Stars, Niang averaged a team-high 22 points per game. He ranked ninth league-wide in scoring and second in field goal percentage. Niang is on the road and practicing with the Jazz in their series against the Oklahoma City Thunder. The Jazz went 11-of-28 on Sunday from beyond the arc, something that needs to change going forward. They also allowed the Thunder to shoot 14-of-29 from 3-point range.